Hallo beste lezers, welkom in 2018! Wij hebben even een korte pauze ingelast maar gaan er weer met frisse moed tegenaan! Vandaag starten wij met een korte video waarin de grafieken van onze klimaatwetenschappers eens streng onder de loep gelegd worden. Door dit te doen zoals dit gebeurt in de video kun je een beeld krijgen van hoe simpel het klimaatbedrog werkt. Het inzoomen van grafieken maakt de conclusie van zo’n grafiek compleet anders. Zoom je de ingezoomde grafieken zelf uit, dan zie je hoe groot ( of in dit geval hoe klein ) de verschillen daadwerkelijk zijn. Mocht je dit jaar een soortgelijke discussie moeten voeren met een klimaatalarmist, houd dan deze voorbeelden bij de hand. ( Maak er screenshots van met je telefoon bijvoorbeeld ). Voor de mensen die de cijfers nog eens allemaal op een rijtje willen zien, deze kunnen deze link gebruiken alwaar een uitgebreid artikel je laat zien waarom Global Warming onzin is. Voor de zekerheid plaatsen wij dat artikel in zijn geheel onderaan ons artikel. o view this article in 150-dpi PDF, 300-dpi PDF, or 600-dpi PDF, click on the appropriate item in this sentence. 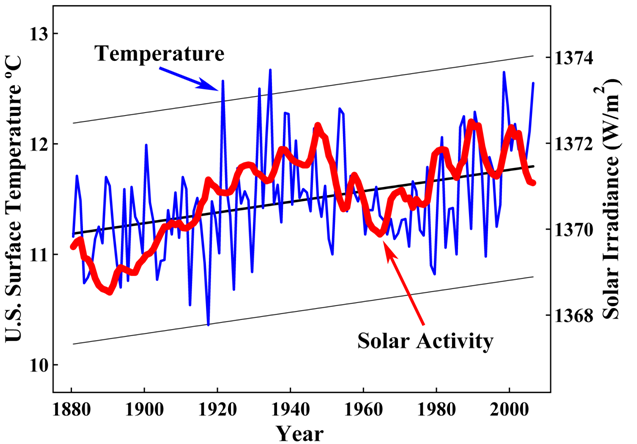 Figure 4: Annual mean surface temperatures in the contiguous United States between 1880 and 2006 (10). 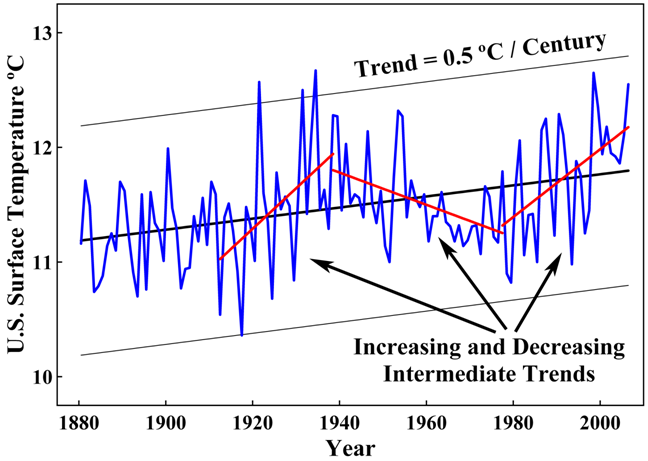 The slope of the least-squares trend line for this 127-year record is 0.5 ºC per century. 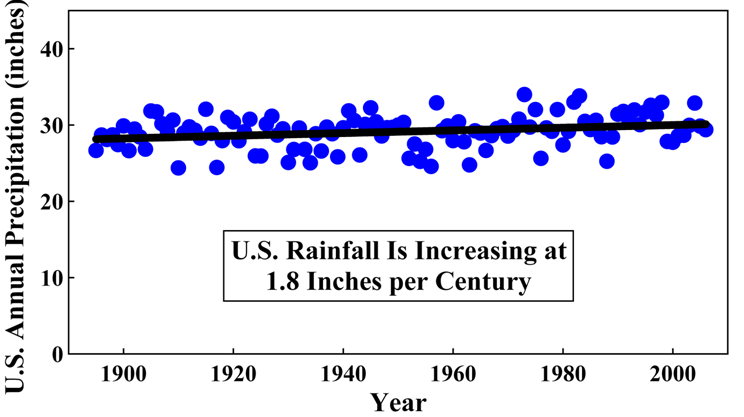 Figure 4 shows the annual temperature in the United States during the past 127 years. 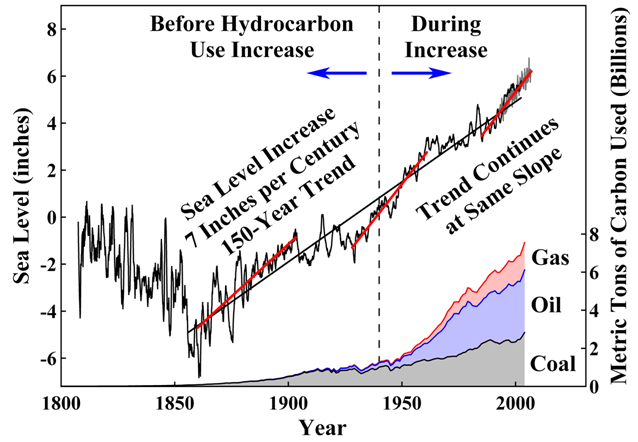 This record has an upward trend of 0.5 ºC per century. 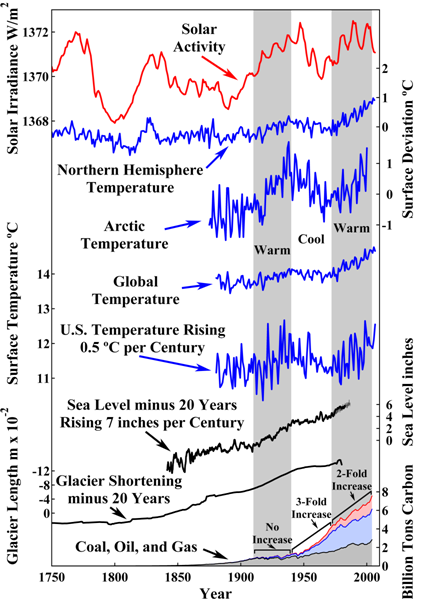 Global and Northern Hemisphere surface temperature records shown in Figure 13 trend upward at 0.6 ºC per century. 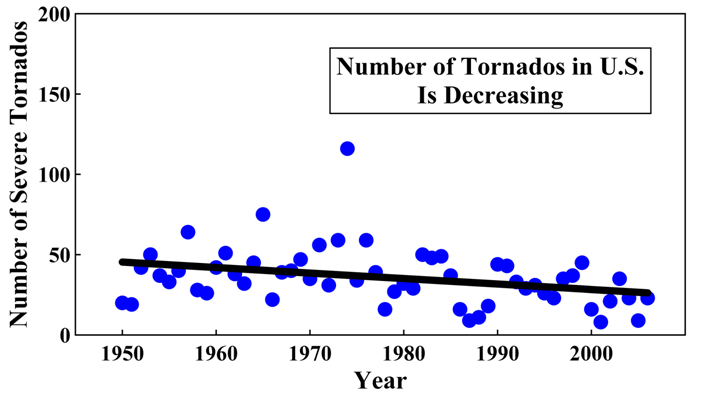 These records are, however, biased toward higher temperatures in several ways. 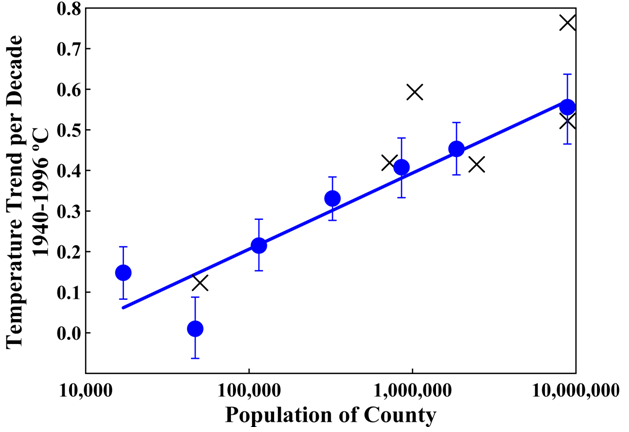 For example, they preferentially use data near populated areas (33), where heat island effects are prevalent, as illustrated in Figure 15. 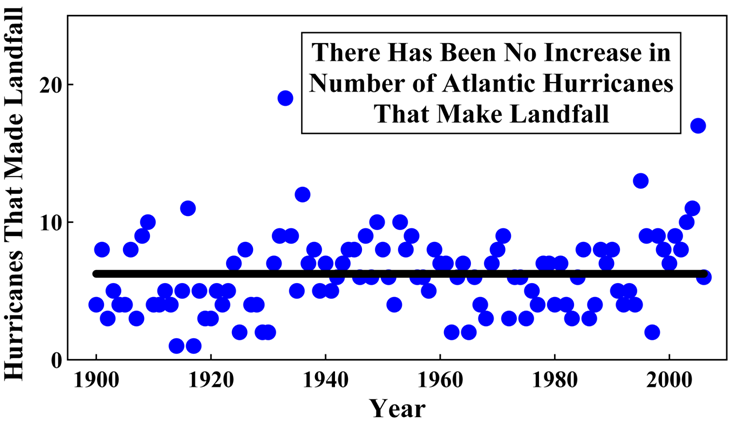 A trend of 0.5 ºC per century is more representative (13-17). Figure 14: Satellite microwave sounding unit (blue) measurements of tropospheric temperatures in the Northern Hemisphere between 0 and 82.5 N, Southern Hemisphere between 0 and 82.5 S, tropics between 20S and 20N, and the globe between 82.5N and 82.5S between 1979 and 2007 (29), and radiosonde balloon (red) measurements in the tropics (29). The balloon measurements confirm the satellite technique (29-31). 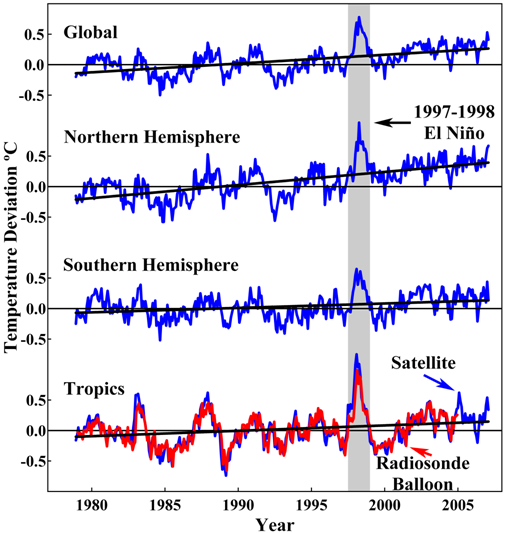 The warming anomaly in 1997-1998 (gray) was caused by El Niño, which, like the overall trends, is unrelated to CO2 (32). 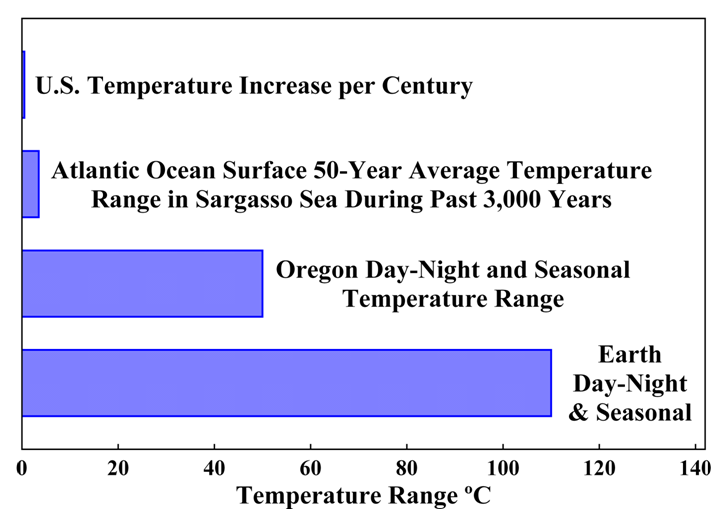 Figure 6 illustrates the magnitudes of these temperature changes by comparing the 0.5 ºC per century temperature change as the Earth recovers from the Little Ice Age, the range of 50-year averaged Atlantic ocean surface temperatures in the Sargasso Sea over the past 3,000 years, the range of day-night and seasonal variation on average in Oregon, and the range of day-night and seasonal variation over the whole Earth. 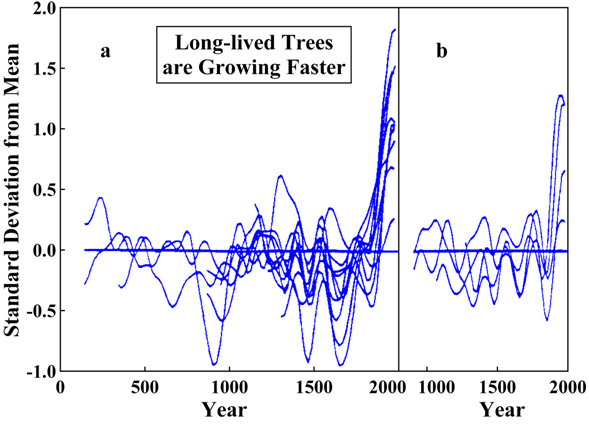 The two-century-long temperature change is small. 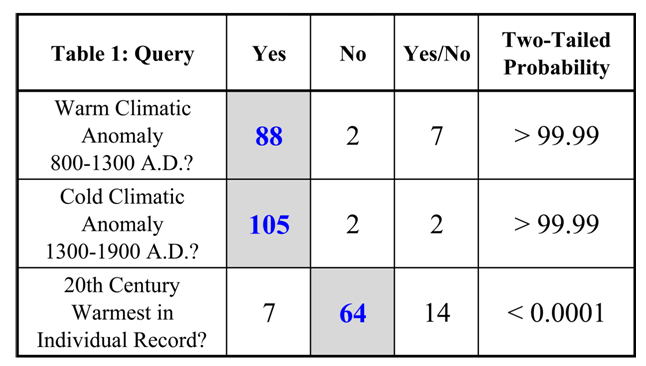 The overall experimental record is self-consistent. 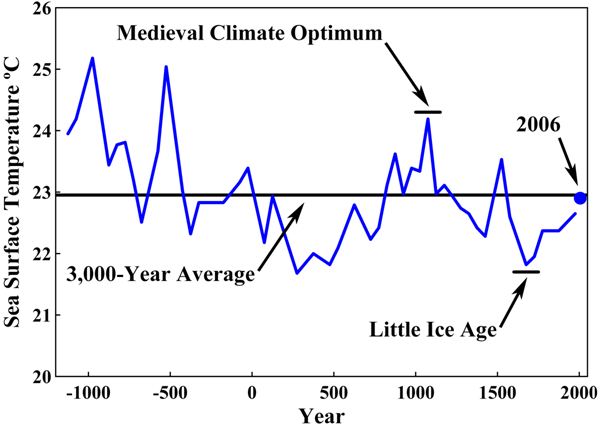 The Earth has been warming as it recovers from the Little Ice Age at an average rate of about 0.5 ºC per century. 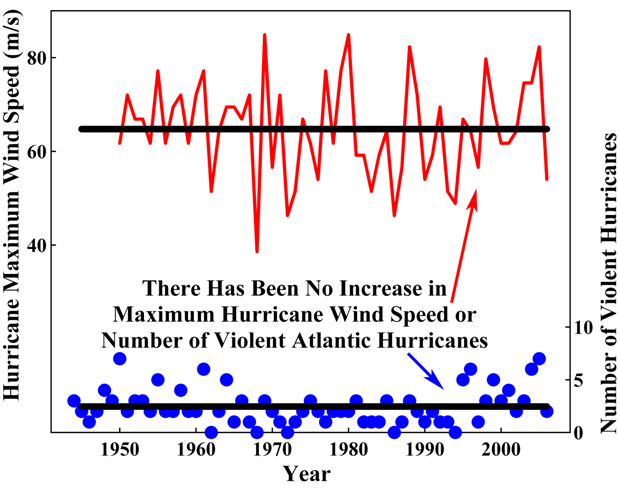 Fluctuations within this temperature trend include periods of more rapid increase and also periods of temperature decrease. These fluctuations correlate well with concomitant fluctuations in the activity of the sun. 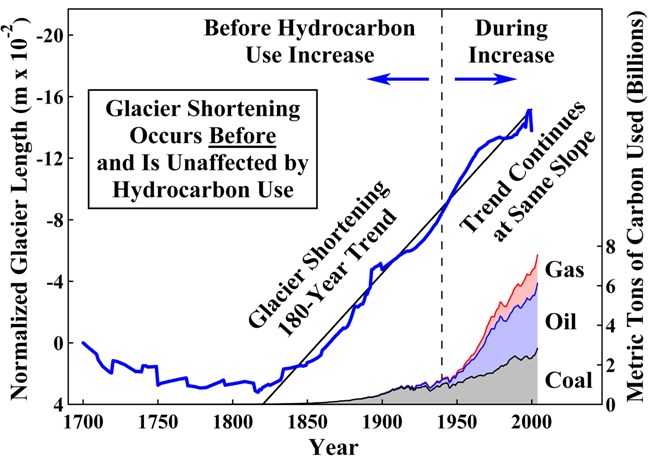 Neither the trends nor the fluctuations within the trends correlate with hydrocarbon use. 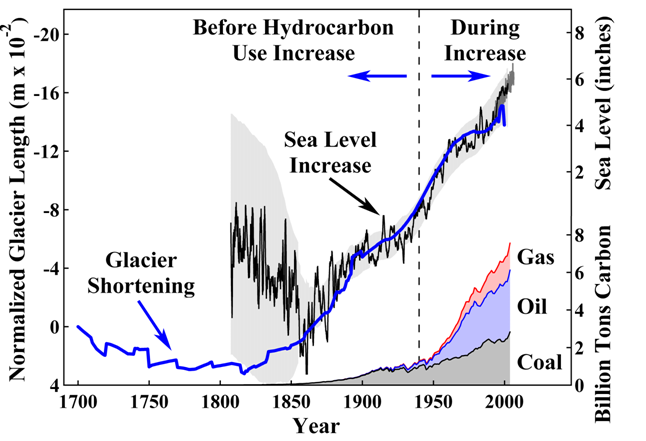 Sea level and glacier length reveal three intermediate uptrends and two downtrends since 1800, as does solar activity. 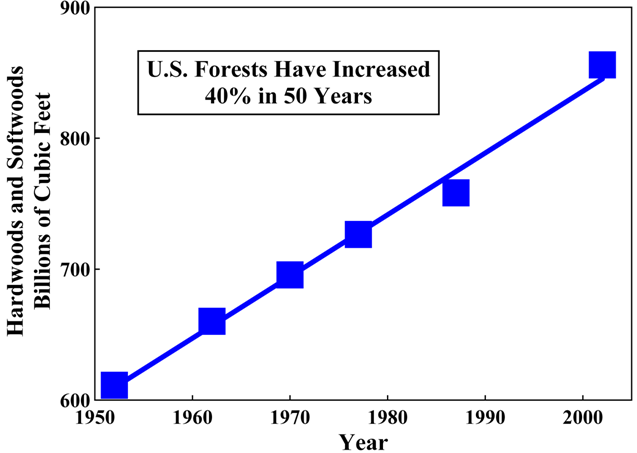 These trends are climatically benign and result from natural processes. 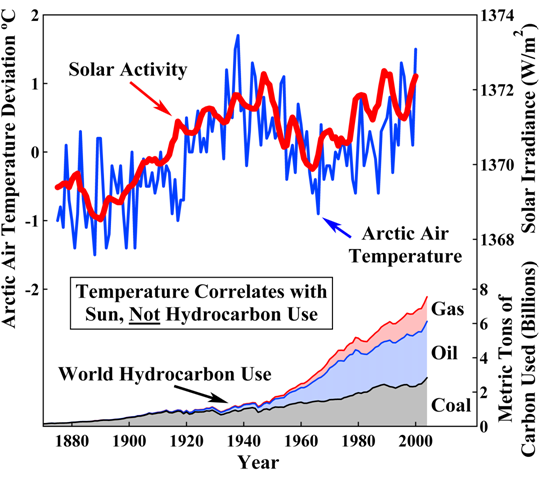 When an increase in CO2 increases the radiative input to the atmosphere, how and in which direction does the atmosphere respond? Hypotheses about this response differ and are schematically shown in Figure 18. 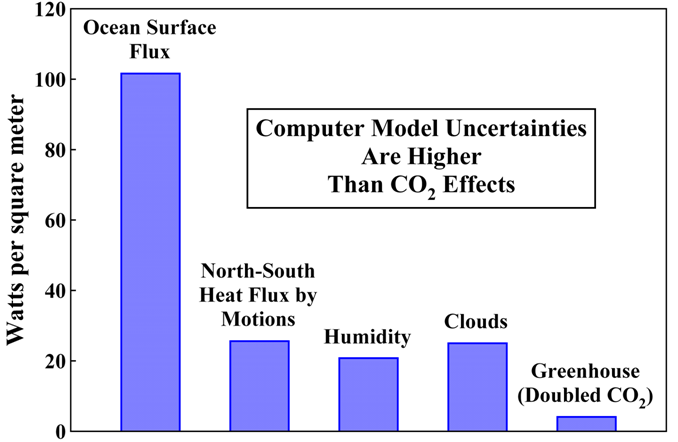 Without the water-vapor greenhouse effect, the Earth would be about 14 ºC cooler (81). 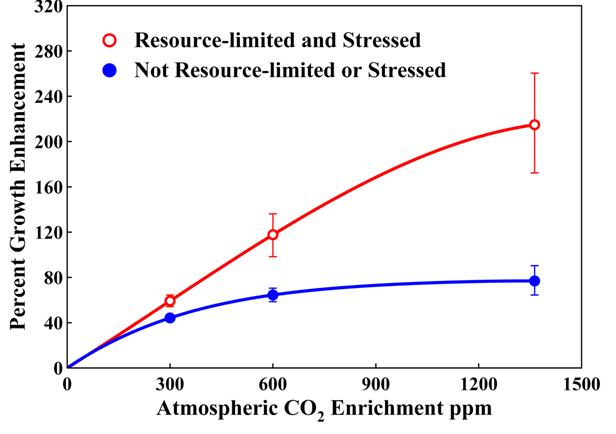 The radiative contribution of doubling atmospheric CO2 is minor, but this radiative greenhouse effect is treated quite differently by different climate hypotheses. 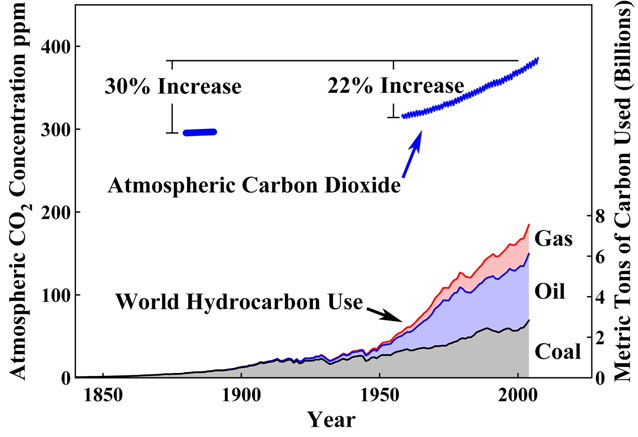 The hypotheses that the IPCC (82,83) has chosen to adopt predict that the effect of CO2 is amplified by the atmosphere, especially by water vapor, to produce a large temperature increase. 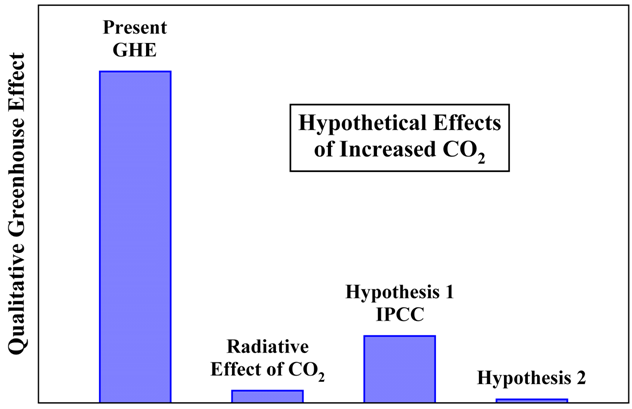 Other hypotheses, shown as hypothesis 2, predict the opposite – that the atmospheric response will counteract the CO2 increase and result in insignificant changes in global temperature (81,84,85,91,92). The experimental evidence, as described above, favors hypothesis 2. 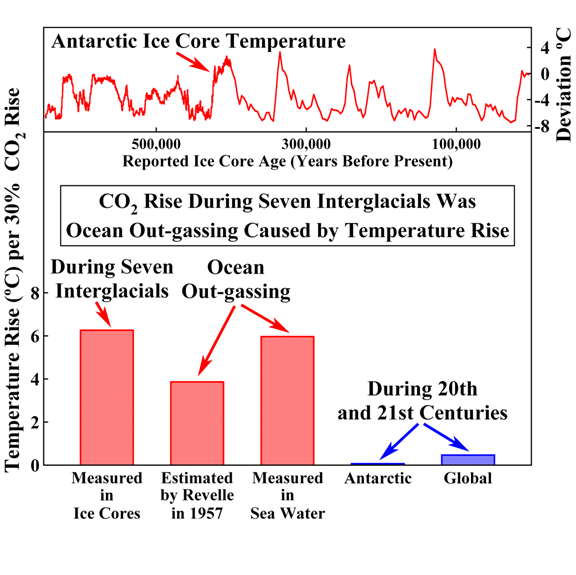 While CO2 has increased substantially, its effect on temperature has been so slight that it has not been experimentally detected. Inexpensively blocking the sun by means of particles in the upper atmosphere would be effective. S.S. Penner, A.M. Schneider, and E. M. Kennedy have proposed (98) that the exhaust systems of commercial airliners could be tuned in such a way as to eject particulate sun-blocking material into the upper atmosphere. Later, Edward Teller similarly suggested (18) that particles could be injected into the atmosphere in order to reduce solar heating and cool the Earth. Teller estimated a cost of between $500 million and $1 billion per year for between 1 ºC and 3 ºC of cooling. Both methods use particles so small that they would be invisible from the Earth. 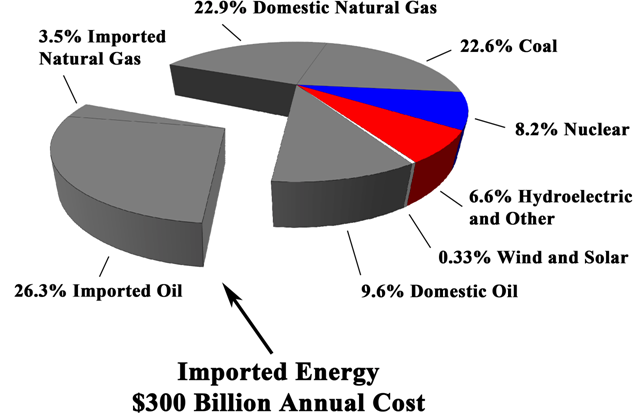 Currently, the United States is a net importer of energy as shown in Figure 25. Americans spend about $300 billion per year for imported oil and gas – and an additional amount for military expenses related to those imports. 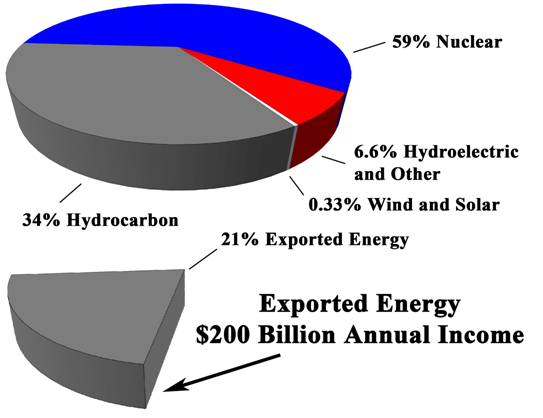 Figure 25: In 2006, the United States obtained 84.9% of its energy from hydrocarbons, 8.2% from nuclear fuels, 2.9% from hydroelectric dams, 2.1% from wood, 0.8% from biofuels, 0.4% from waste, 0.3% from geothermal, and 0.3% from wind and solar radiation. The U.S. uses 21 million barrels of oil per day – 27% from OPEC, 17% from Canada and Mexico, 16% from others, and 40% produced in the U.S. (95). The cost of imported oil and gas at $60 per barrel and $7 per 1,000 ft3 in 2007 is about $300 billion per year. The current untenable situation in which the United States is losing $300 billion per year to pay for foreign oil and gas is not the result of failures of government energy production efforts. The U.S. government does not produce energy. Energy is produced by private industry. Why then has energy production thrived abroad while domestic production has stagnated? Thus, rather than a $300 billion trade loss, the U.S. would have a $200 billion trade surplus – and installed capacity for future U.S. requirements. Moreover, if heat from additional nuclear reactors were used for coal liquefaction and gasification, the U.S. would not even need to use its oil resources. The U.S. has about 25% of the world's coal reserves. This heat could also liquify biomass, trash, or other sources of hydrocarbons that might eventually prove practical. Figure 27: Construction of one Palo Verde installation with 10 reactors in each of the 50 states. Energy trade deficit is reversed by $500 billion per year, resulting in a $200 billion annual surplus. Currently, this solution is not possible owing to misguided government policies, regulations, and taxation and to legal maneuvers available to anti-nuclear activists. These impediments should be legislatively repealed. 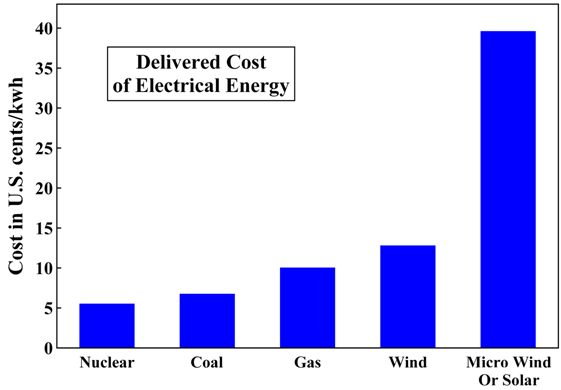 Assuming a construction cost of $2.3 billion per 1,200 MWe reactor (127) and 15% economies of scale, the total cost of this entire project would be $1 trillion, or 4 months of the current U.S. federal budget. This is 8% of the annual U.S. gross domestic product. Construction costs could be repaid in just a few years by the capital now spent by the people of the United States for foreign oil and by the change from U.S. import to export of energy. About 33% of the thermal energy in an ordinary nuclear reactor is converted to electricity. Some new designs are as high as 48%. The heat from a 1,243 MWe reactor can produce 38,000 barrels of coal-derived oil per day (129). With one additional Palo Verde installation in each state for oil production, the yearly output would be at least 7 billion barrels per year with a value, at $60 per barrel, of more than $400 billion per year. This is twice the oil production of Saudi Arabia. Current proven coal reserves of the United States are sufficient to sustain this production for 200 years (128). This liquified coal exceeds the proven oil reserves of the entire world. The reactors could produce gaseous hydrocarbons from coal, too. 5. Oerlemanns, J., Björnsson, H., Kuhn, M., Obleitner, F., Palsson, F., Smeets, C. J. P. P., Vugts, H. F., and De Wolde, J. 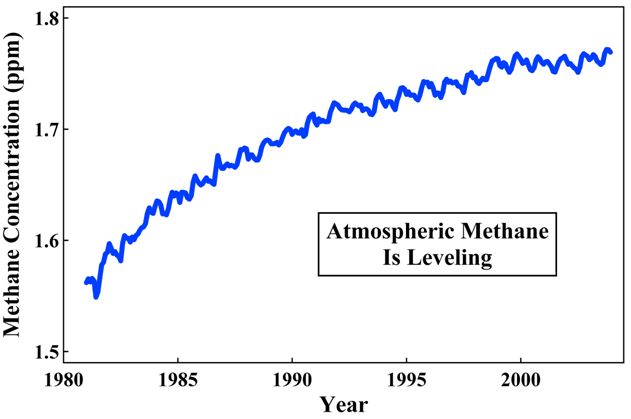 (1999) Boundary-Layer Meteorology 92, 3-26. 12. 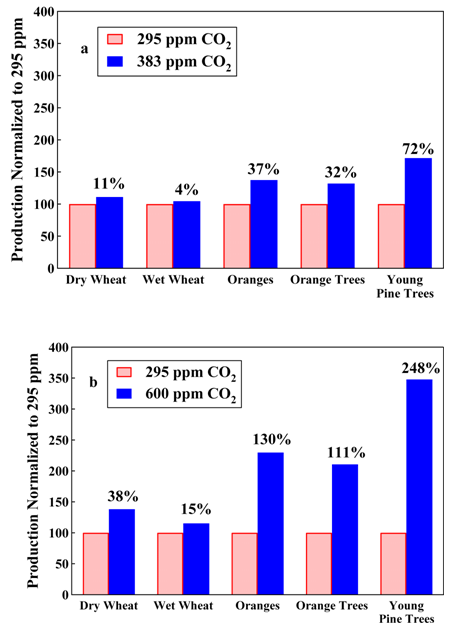 Idso, S. B. and Idso, C. D. (2007) Center for Study of Carbon Dioxide and Global Change http://www.co2science.org/scripts/CO2ScienceB2C/education/reports/hansen/hansencritique.jsp. 23. Goldenberg, S. B., Landsea, C. W., Mesta-Nuñez, A. M., and Gray, W. M. (2001) Science 293, 474-479. 29. Christy, J. R., Norris, W. B., Spencer, R. W., and Hnilo, J. J. (2007) J. Geophysical Res. 112, 2005JD006881. http://vortex.nsstc.uah.edu/data/msu/t2lt/uahncdc. 411, 290-293. 37. Jiang, H., Eiríksson, J., Schulz, M., Knudsen, K., and Seidenkrantz, M. (2005) Geology 33, 73-76. Maar wel de vervuilende kankerverwekkend stoffen die de industrieÃ«n uitstoten?